one-G simulation is intent on expanding career pathways for youth in aviation through better access to simulation. 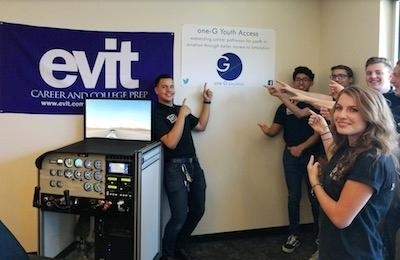 Building upon one-G Access, the industry’s only pay-per-use flight simulator program, the company launches the one-G Youth Access program with the donation of an FAA approved flight training device to East Valley Institute of Technology (EVIT), a career and college prep school. one-G simulation is a flight simulation firm that designs and builds Federal Aviation Administration (FAA) approved model specific AATDs, and a host of aviation related training products, including its proprietary software for use in pilot training and pilot proficiency.